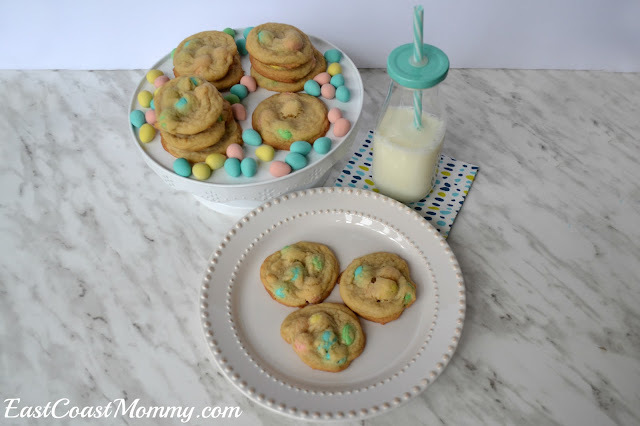 Today I am sharing a super-simple Easter idea. 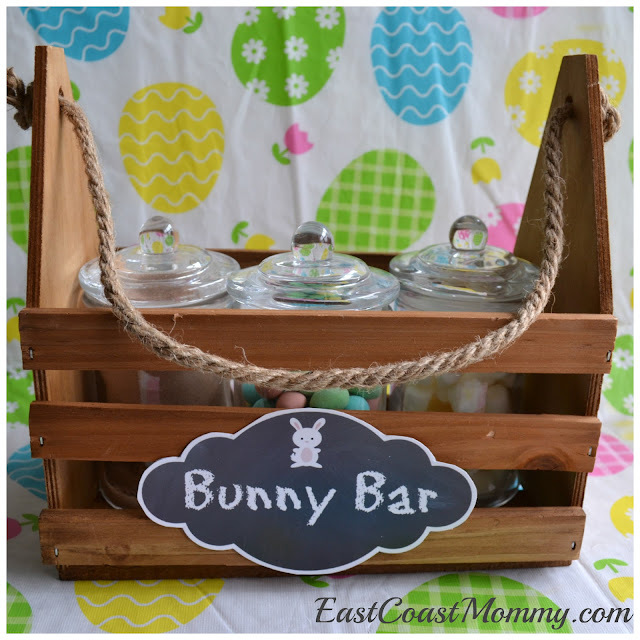 I picked up a few supplies from the dollar store, and I put together this easy Easter hot chocolate bar in less than 5 minutes! This idea is perfect for an intimate family Easter, and it's fun if you are hosting a bunch of people too. You could even add some "adult" drinks for the grown ups. 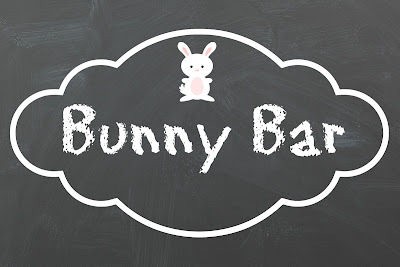 A "bunny bar" can be as simple or elaborate as you want. I purchased this adorable crate from the dollar store (for $4), and I added a simple sign that I designed. I also purchased three dollar store jars (for $1.50 each) to hold my "bar" ingredients. 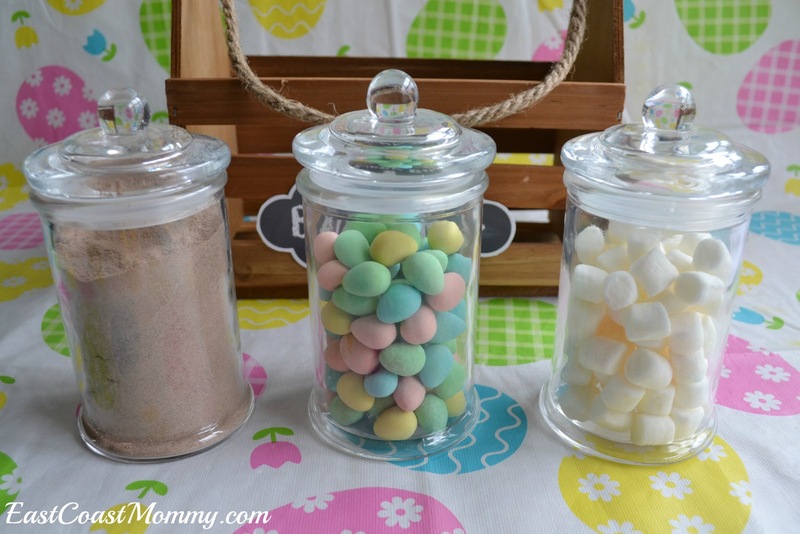 I filled my jars with hot chocolate, candy coated chocolate mini eggs, and mini marshmallows. To download the "bunny bar" sign: click on the picture below, right-click, save it to your computer, and print it like a regular 4X6 photo. 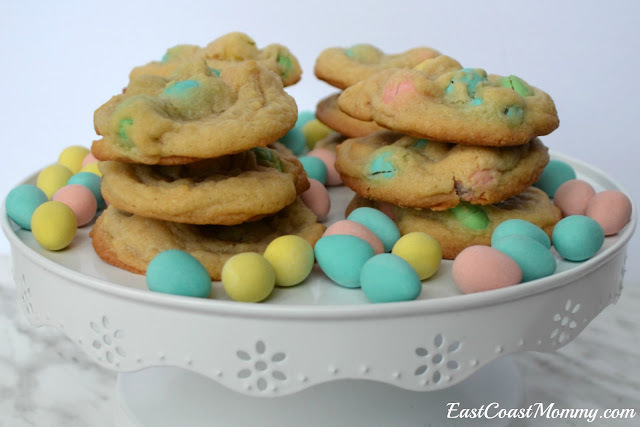 Of course, you'll need to serve a batch of festive Easter cookies to go with the hot chocolate. 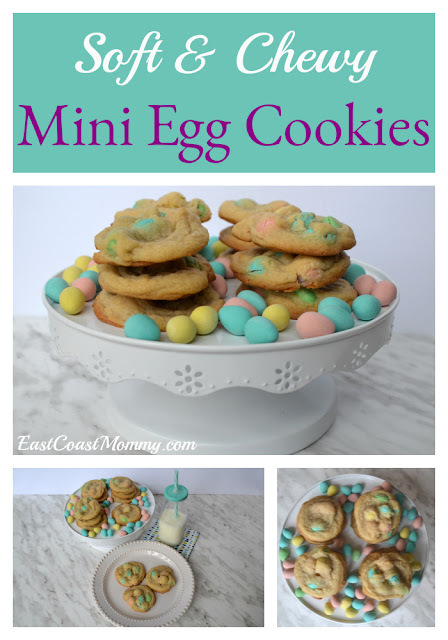 I am loving these soft and chewy mini egg cookies, and they would look fantastic next to the bunny bar. 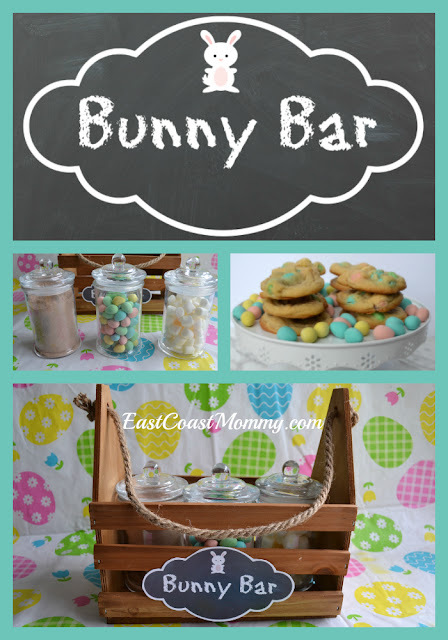 I think a "bunny bar" is the perfect way to serve treats to your Easter guests. 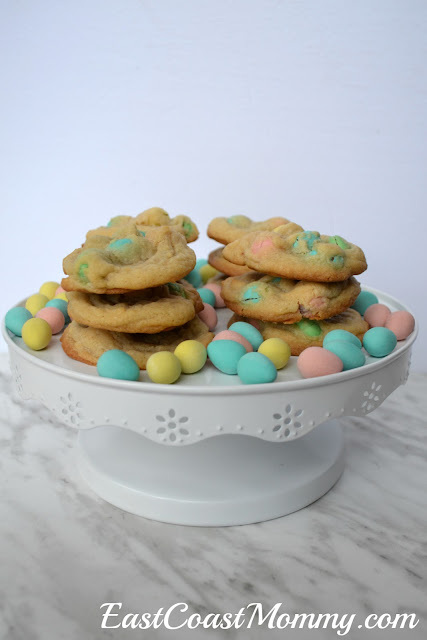 It's an easy and inexpensive idea, and it's guaranteed to "up" your hostess game! 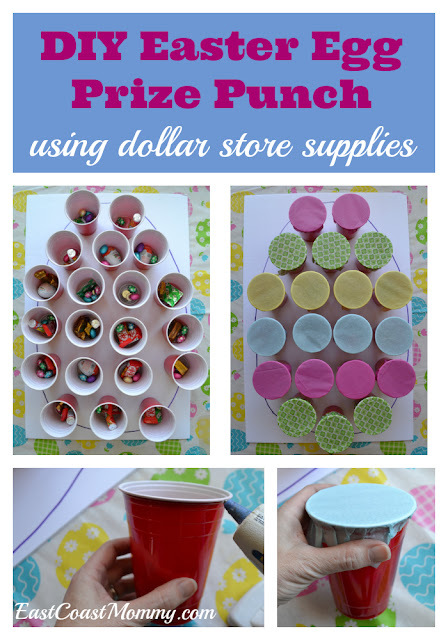 A few years ago, I came up with the idea for a "prize punch" using dollar store supplies. 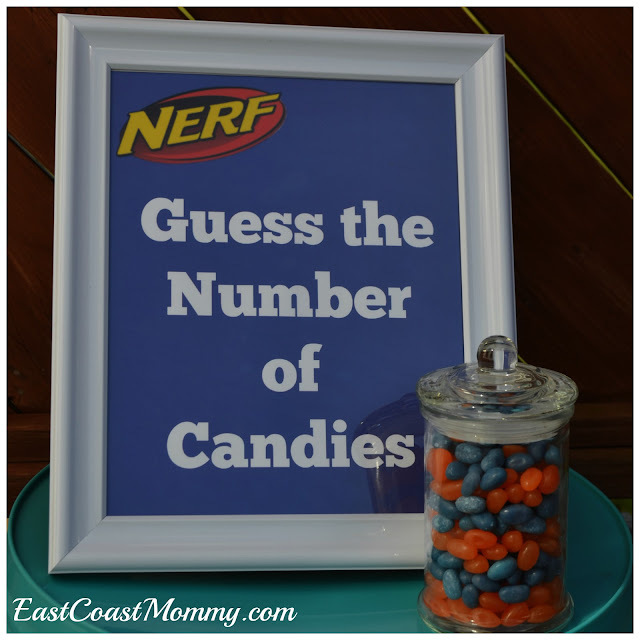 It was a huge hit with my boys, and it is now a staple at all our birthday party and holiday celebrations. 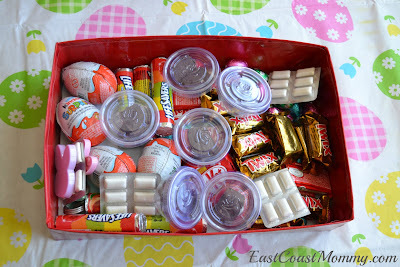 This year, I decide to make an Easter Egg Prize punch. 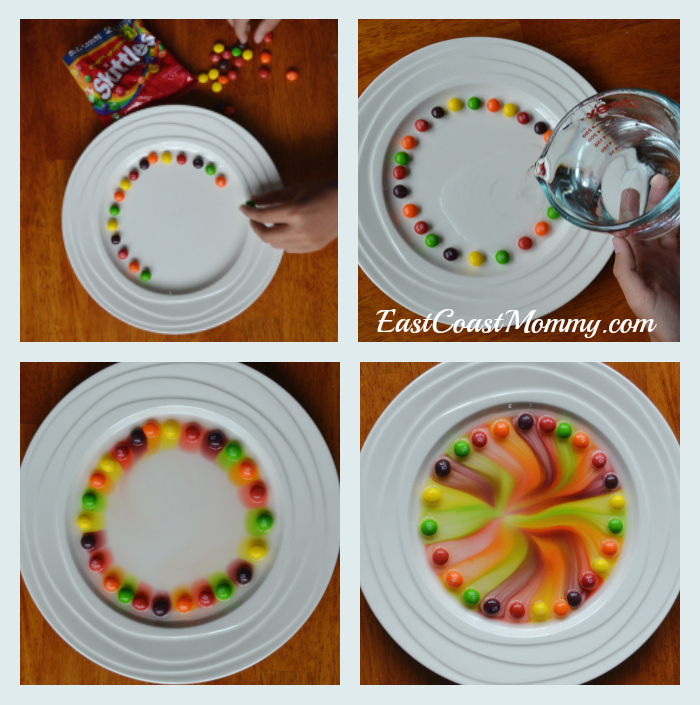 Today I am sharing the full tutorial (and craft video) for this simple and festive DIY project. First, you'll need some treats and dollar store trinkets (that are small enough to fit in a plastic cup. 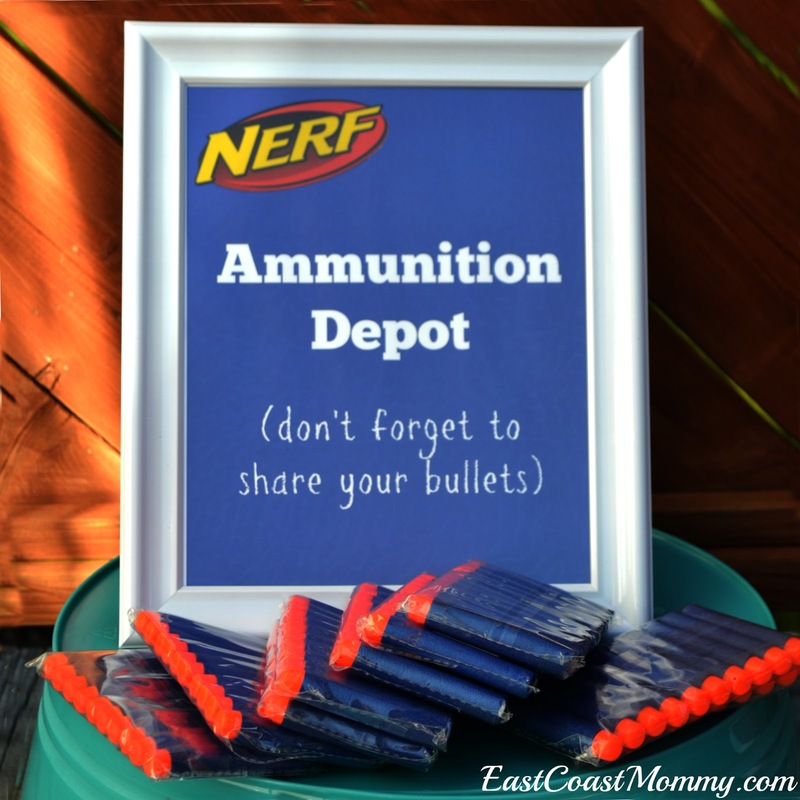 You'll also need plastic cups, a piece of foam core, tissue paper and a glue gun. 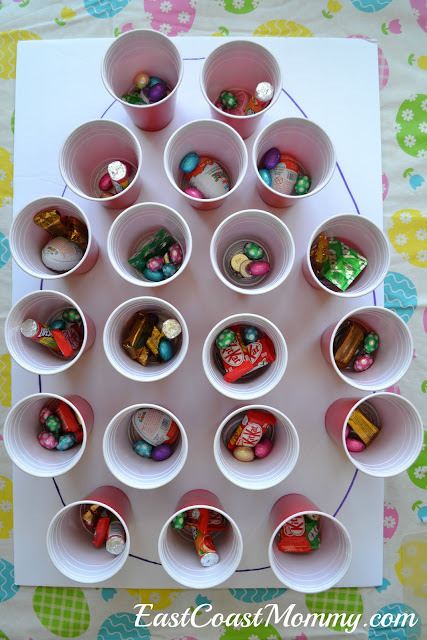 Arrange the cups in the shape of an egg, and fill the cups with treats. 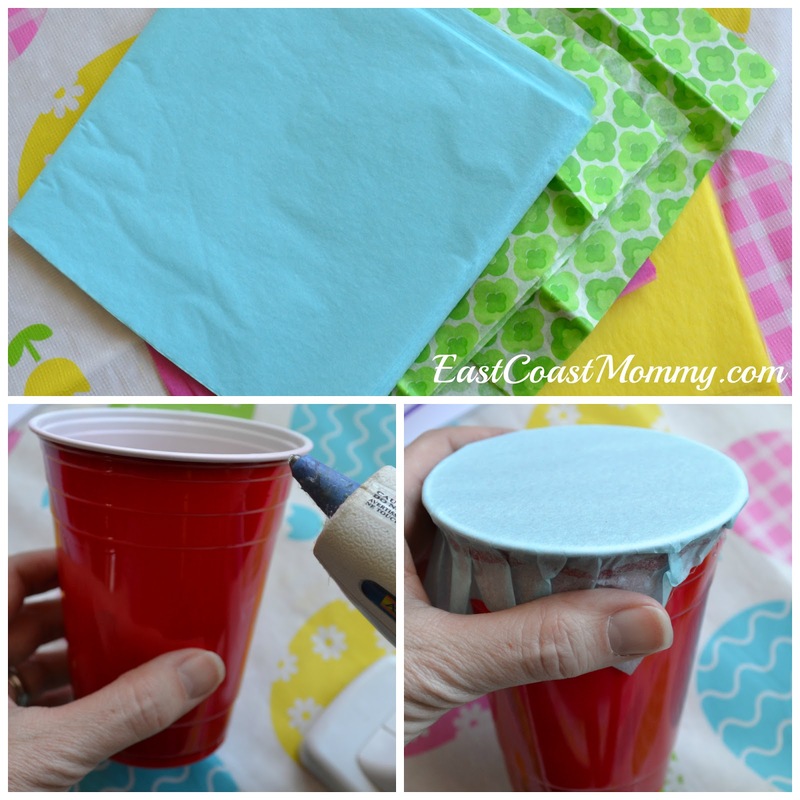 Apply hot glue to the rim of a plastic cup and cover it with a square piece of tissue paper. (You can add a second piece for extra strength... but this is optional). 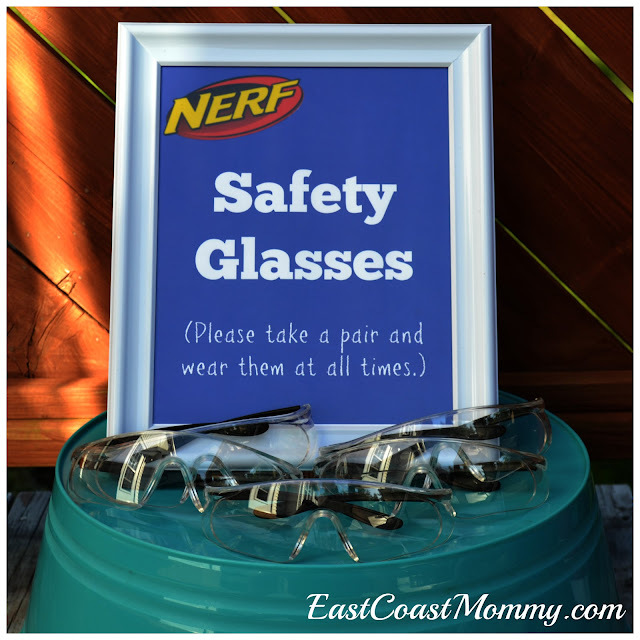 When all the cups are covered, use hot glue on the bottoms of the glasses to attach them to the foam core. Isn't it cute? 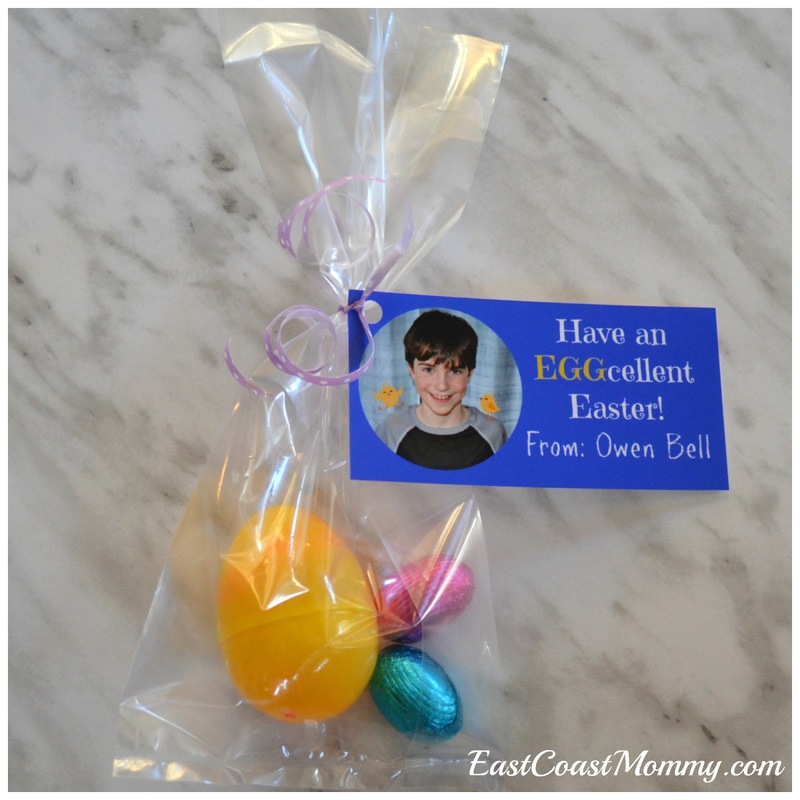 My boys will love poking through the tissue paper to claim their prizes on Easter morning. Still wondering how to make a DIY Easter Egg Prize Punch? 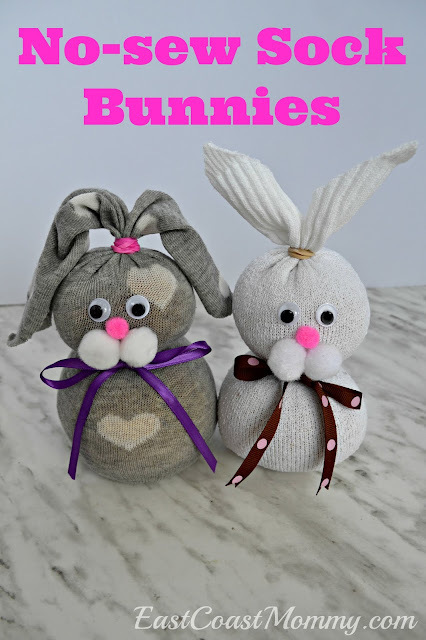 Check out this easy to follow craft video I made. This DIY Easter Egg Prize Punch is really easy and inexpensive to make, and you don't need to be super-crafty to be successful. If you can work a glue gun, you can make one! Come on... give it a try... and let me know how it turns out. 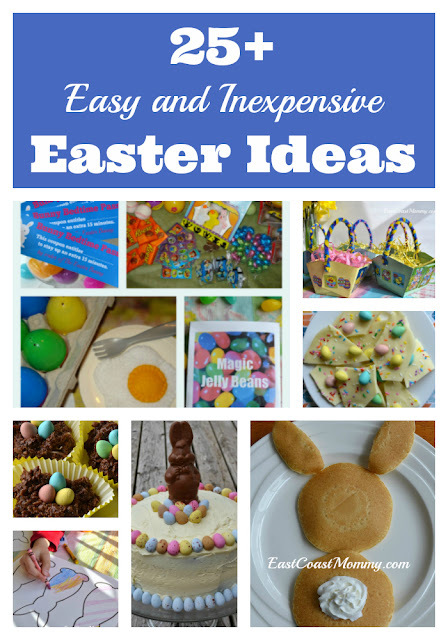 You can find more easy and inexpensive Easter crafts, recipes and ideas here. Party signs help keep things organized, and they create a fun party atmosphere. I love using party signage as decor, and today I am sharing the signs I used for my boys' joint NERF gun party... and you can download any of my NERF party signs for free. 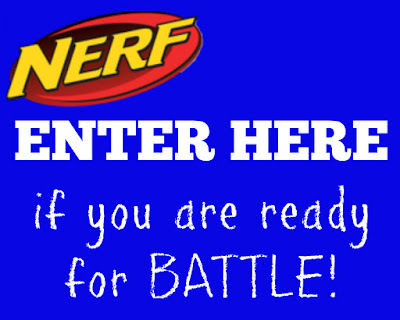 As the kids came in, I had a sign that said "Enter Here if you are ready for Battle!" 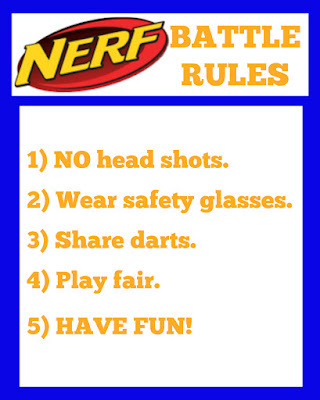 I also had a sign listing all the NERF battle safety rules. 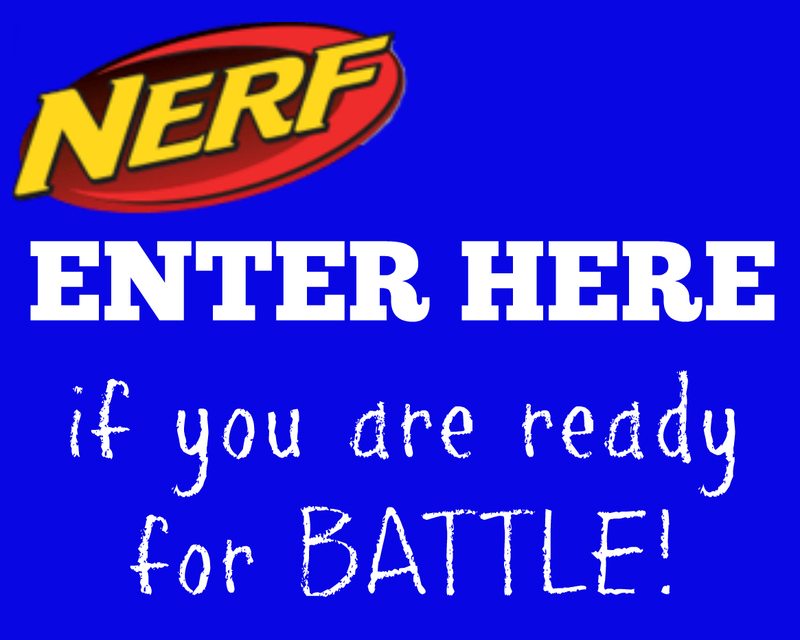 To download the "Enter Here" sign: click on the picture below, right-click, save it to your computer, and print it like a regular 8x10 photo. 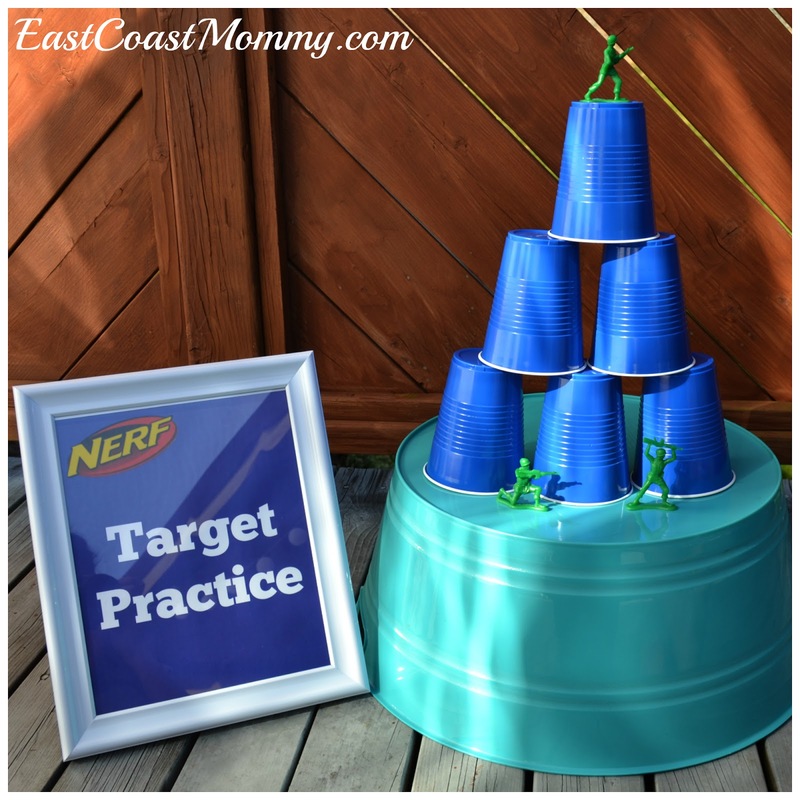 I attached mine to a piece of dollar store foam core and added a colourful target. 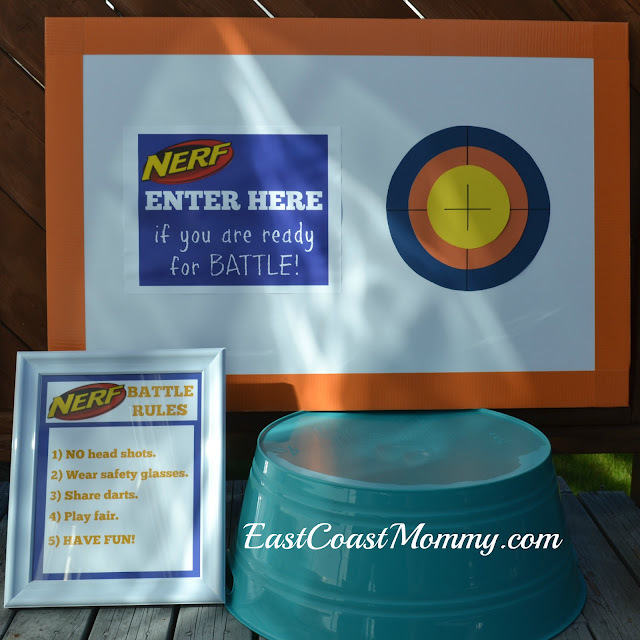 I printed a copy of the Battle Rules and put it in an inexpensive dollar store frame. To download the "NERF battle rules": click on the picture below, right-click, save it to your computer, and print it like a regular 8X10 photo. 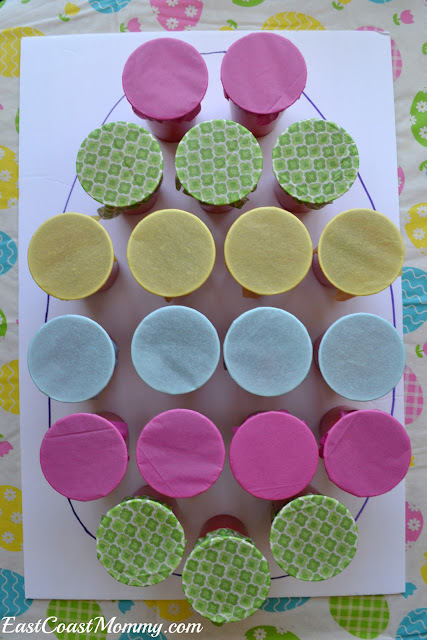 I created a food table backdrop using a tri-fold from the dollar store. 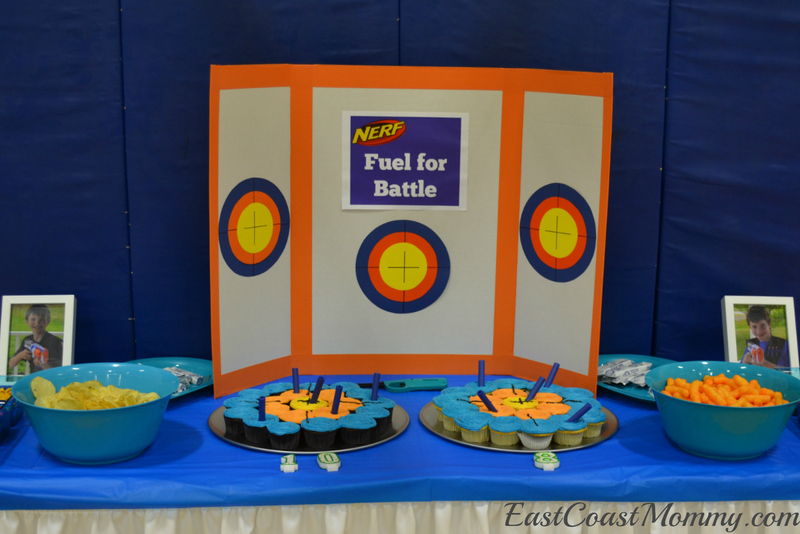 I added a "Fuel for Battle" sign, trimmed it with orange duct tape, and added some targets made from construction table circles. 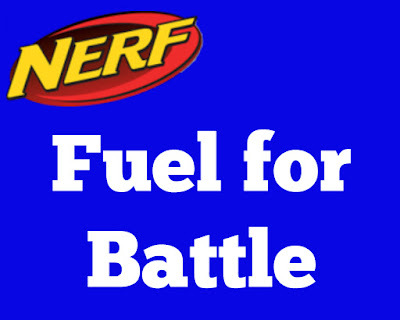 To download the "Fuel for Battle" sign: click on the picture below, right-click, save it to your computer, and print it like a regular 8X10 photo. I created an ammunition depot for all the NERF gun bullets. I printed a sign and put it in a dollar store frame. 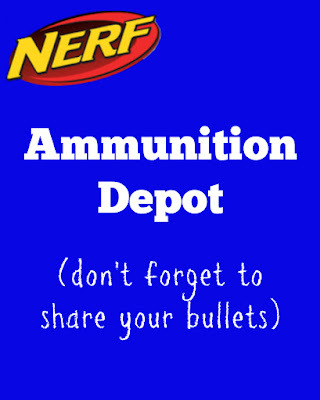 To download the "Ammunition Depot" sign: click on the picture below, right-click, save it to your computer, and print it like a regular 8X10 photo. I had a safety glasses station where all the kids picked up their safety glasses... because "safety first". I printed the sign and put it in a dollar store frame. 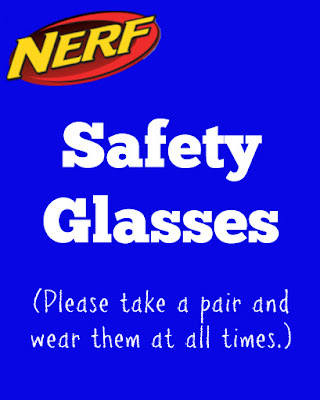 To download the "Safety Glasses" sign: click on the picture below, right-click, save it to your computer, and print it like a regular 8X10 photo. 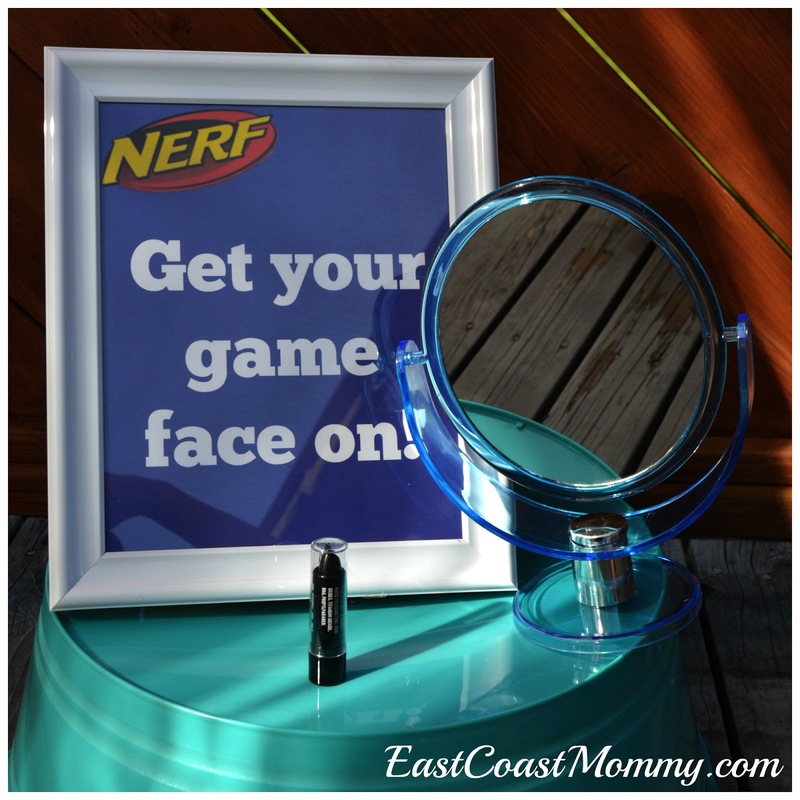 I had a spot for the kids to "Get their game face on". I put a sign in a dollar store frame, and I added some black under eye make up and a dollar store mirror. To download the "Get your game face on" sign: click on the picture below, right-click, save it to your computer, and print it like a regular 8X10 photo. One of our games was "Guess the Number of Candies". I put a sign in a dollar store frame and placed it behind a jar of candies. 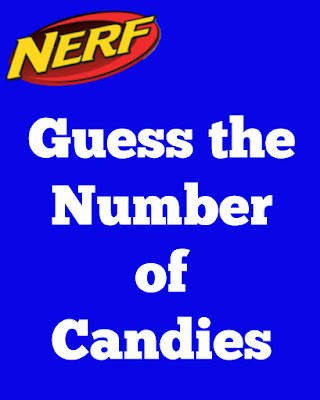 To download the "Guess the number of candies sign": click on the photo below, right-click, save it to your computer, and print it like a regular 8X10 photo. I also had a wall of "Target Practice". I printed a sign and placed it in a dollar store frame next to our targets. 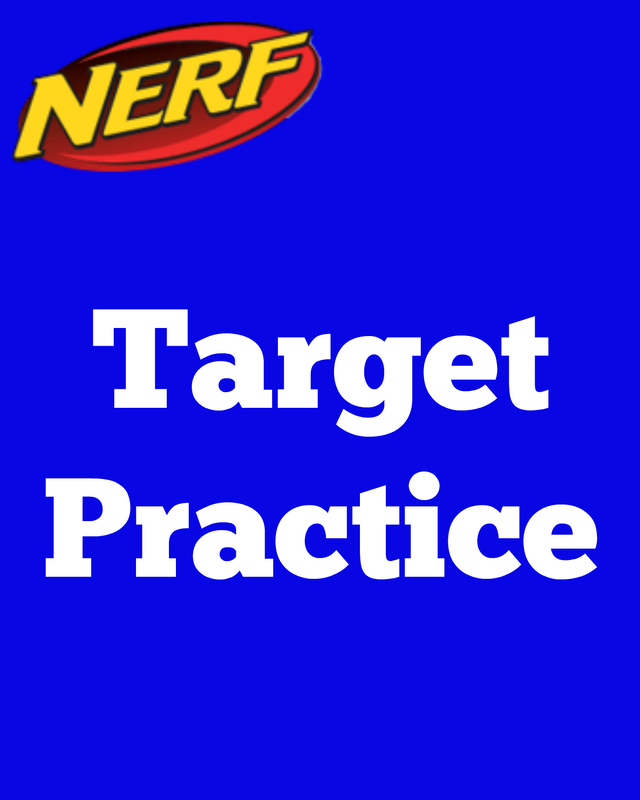 To download the "Target Practice" sign: click on the picture below, right-click, save to your computer, and print like a regular 8X10 photo. 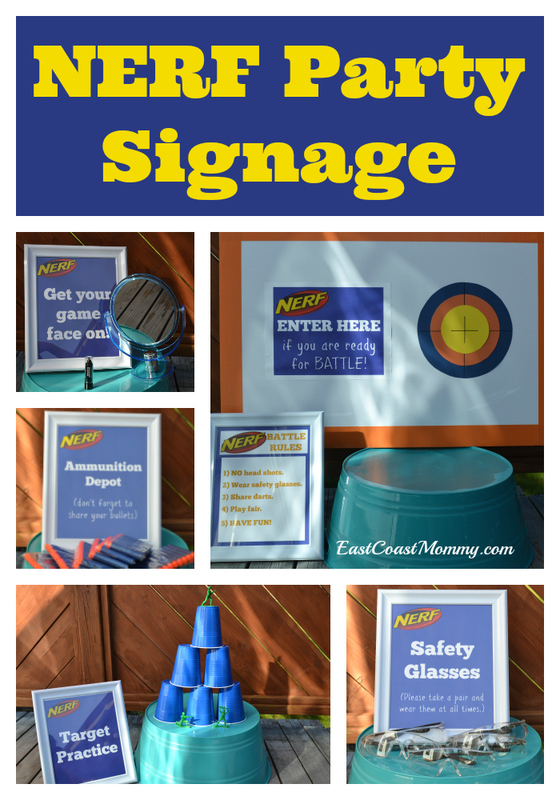 I think customized signs create fantastic party decor and add a fun, personalized element to parties. If you are planning a NERF party, I hope you have some fun with my free NERF party signs! 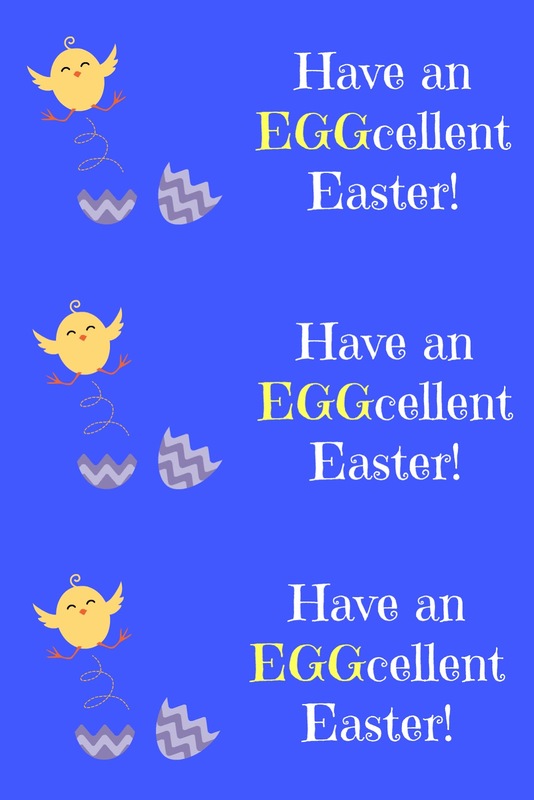 It's March, so it's the perfect time to start thinking about Easter. I love to send my boys to school with treats for their classmates, but I'm always worried about food allergies. So, in recent years I've tried to find a cute dollar store trinkets that my boys can share with their friends, and attaching a "punny" note makes them extra fun. 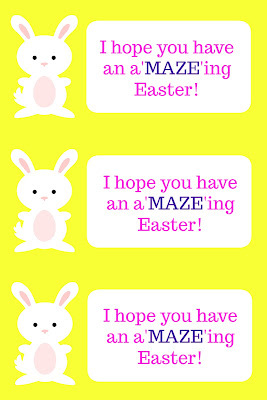 Today, I am sharing an a"MAZE"ing Easter treat idea and adorable tags that you can download for free. Isn't this a sweet treat? I found these little "maze" games at our dollar store, and they were only $1.25 for 8. Isn't that great? 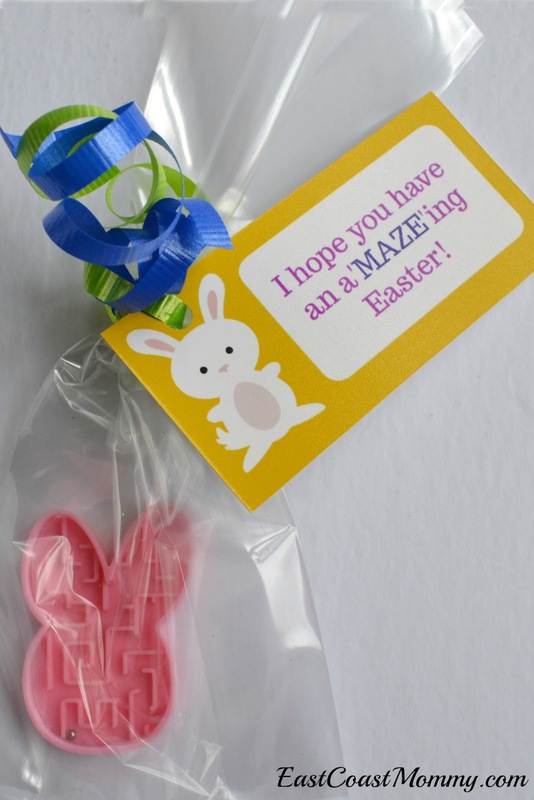 I packaged the mazes in clear plastic bags with "I hope you have an a'MAZE'ing Easter!" tags. I love how bright and cheerful these Easter treats are, and I hope the kids in my son's class will have fun with them. Do you like to send Easter treats to your child's school? 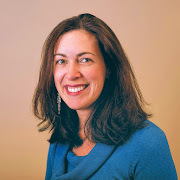 Do you worry about allergies and nutrition policies? 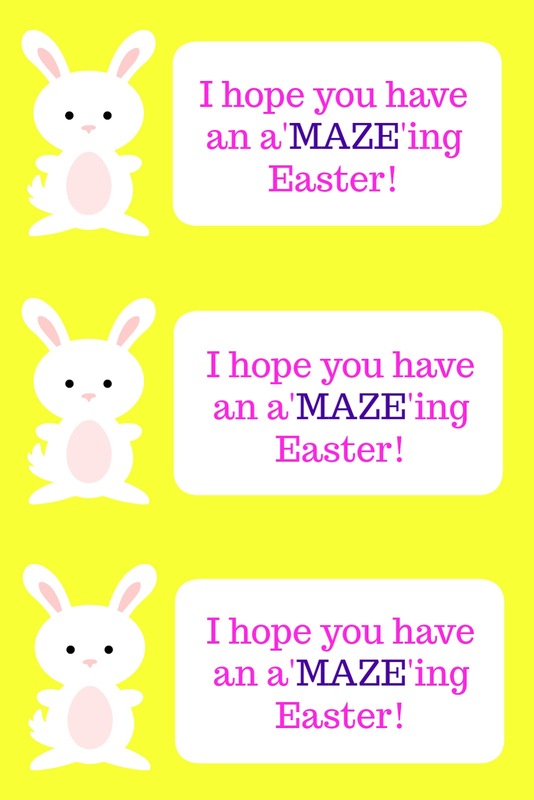 I think these little mazes are the perfect solution. My boys love to share holiday treats with their friends, so I am always looking for ways to turn dollar store trinkets into adorable class treats. 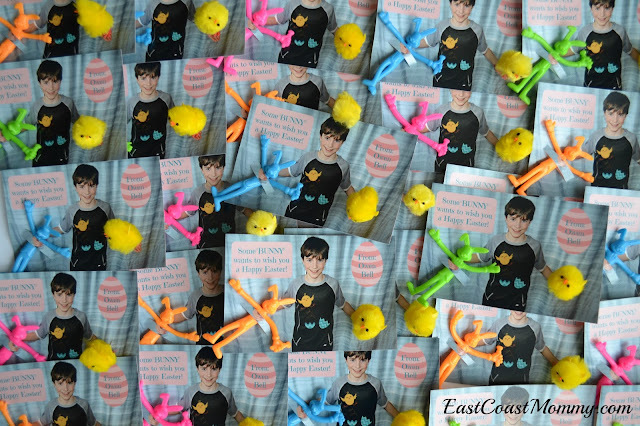 This year, for Easter, my middle son requested that I do something fun with "stretchy bunnies" that we found. I am sharing two fun options for unique Easter class treats with you today. How cute is this photo card I made? 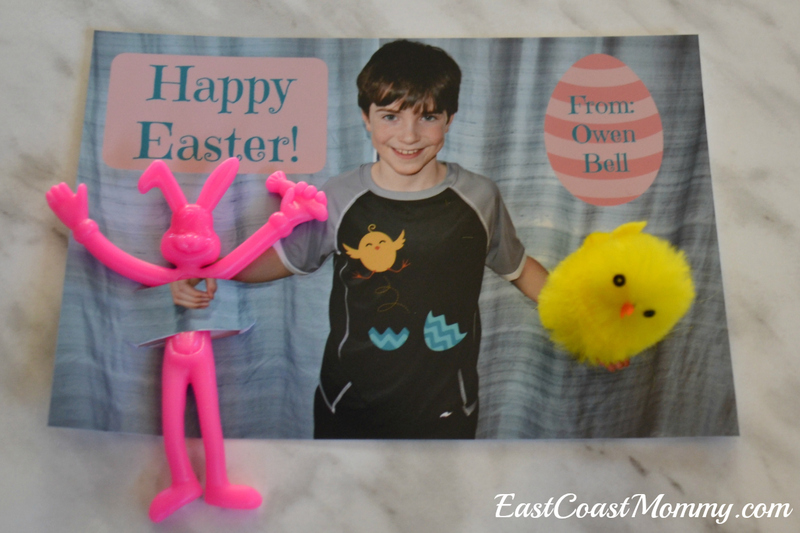 My son loves that he is holding a "stretchy bunny" and soft little chick. The bunnies were $1.25 for eight, and the chicks were $2 for ten. I both both trinkets at the dollar store. 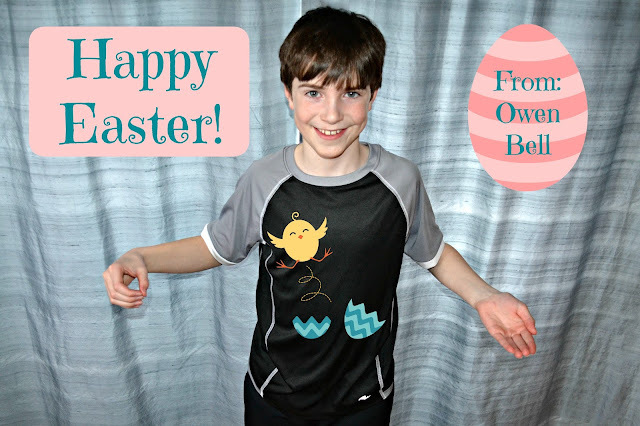 I started with a photo of my son holding out his hands, and I added some Easter details with Picmonkey.com. Then, I used an x-acto knife to cut slits in the picture. I inserted the bunny, and I inserted the feet of the chick. I also added a bit of tape to the back of the picture to make sure the chick's feet didn't slip out. 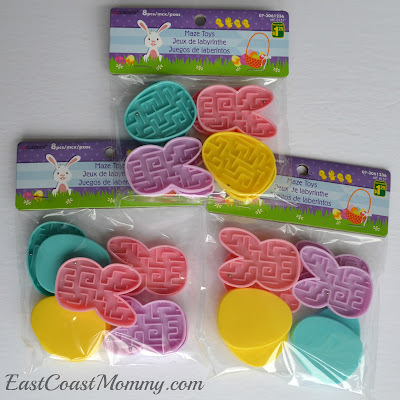 Another option for gifting "stretchy bunnies" is to put them in plastic eggs, package them with chocolate eggs, and add tags that say, "Have an 'EGG'cellent Easter!" 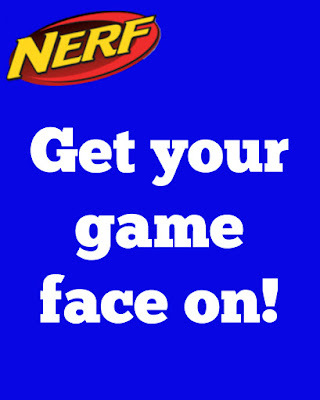 I made personalized tags at Picmonkey.com, but I also designed a generic tag that you can download for free below. 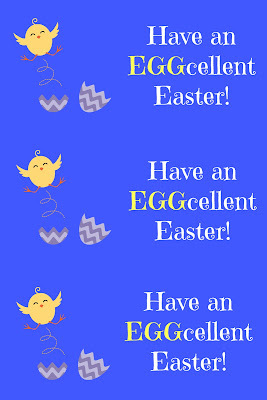 To download this sheet of three generic tags I designed: click on the picture below, right-click, save it to your computer, and print it like a regular 4x6 photo. Although both options are adorable, my son decided to go with the photo option, and I think it was an excellent choice. They are seriously adorable! 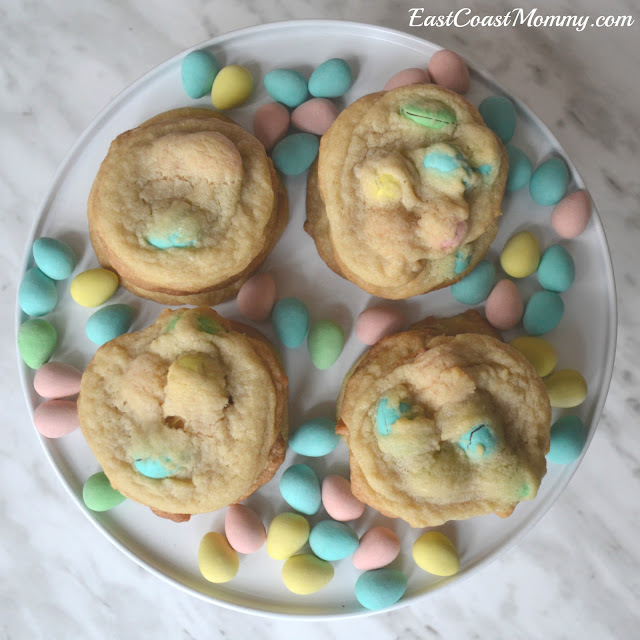 My 10 year old is super-excited to share these easy and inexpensive Easter treats with his friends... and I'm not surprised. They are pretty cute! Do you have someone that would love to give or receive these trinkets too? 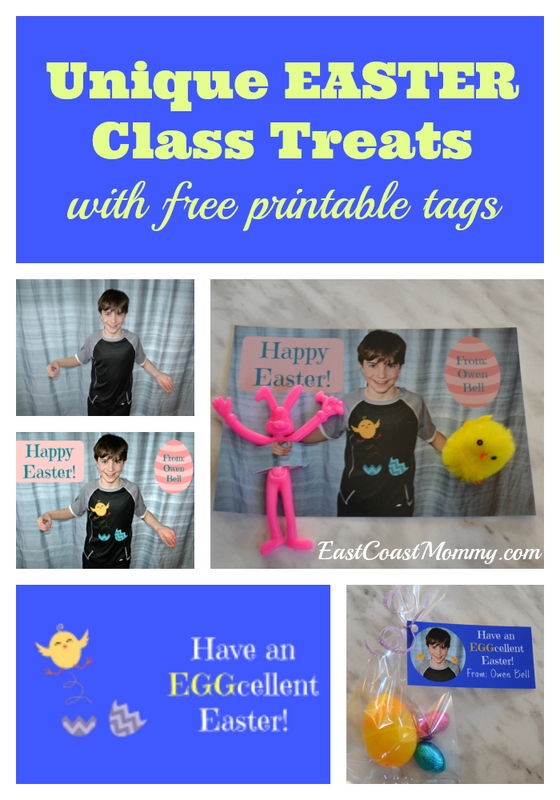 There is no reason you can't add a little learning to a fun holiday celebration. 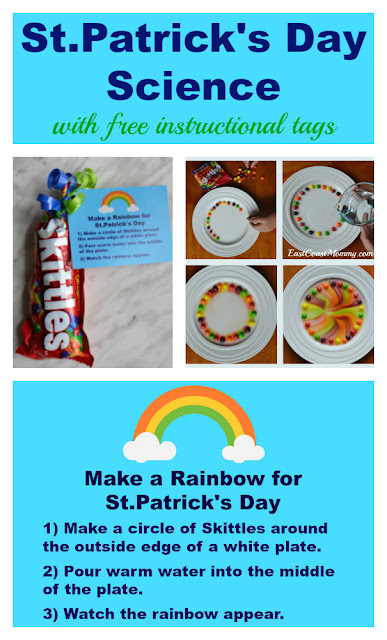 I love the idea of giving kids a "Make a Rainbow" kit for St.Patrick's Day. You are not going to believe how simple and fun this "cause and effect" science experiment is. 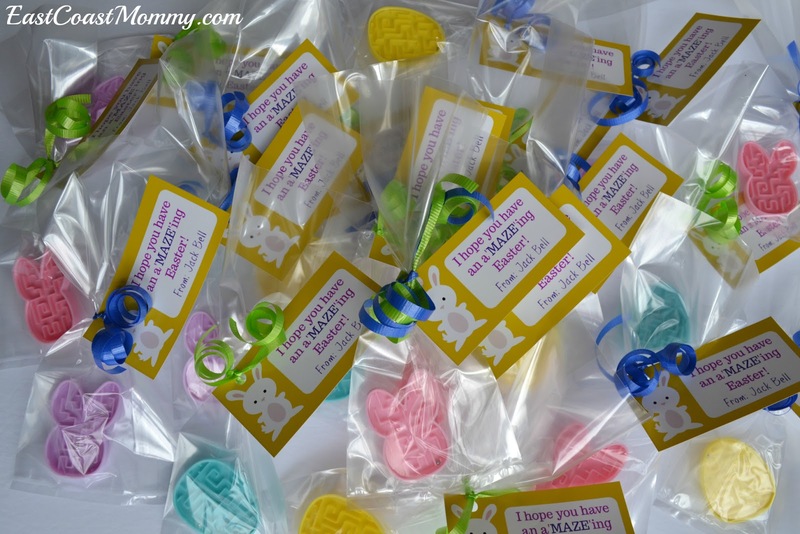 I've even created a free downloadable tag that you can attach to a bag of Skittles for easy gifting. 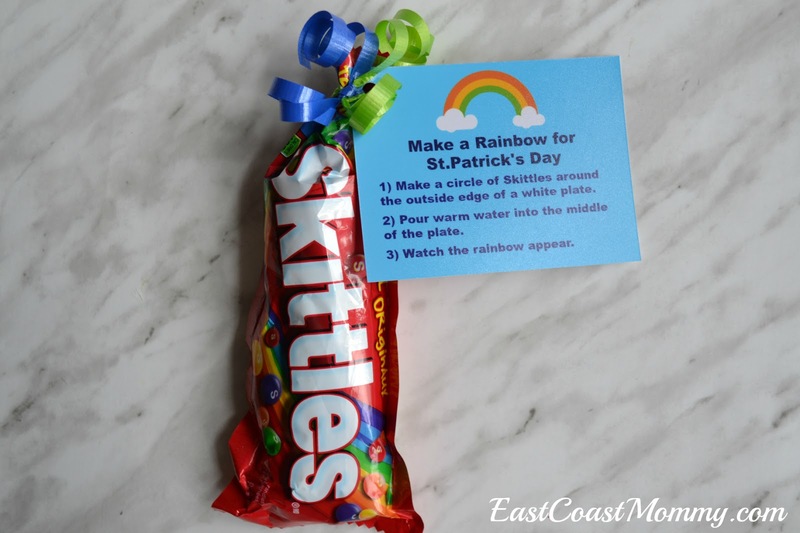 The tag explains exactly what to do to make a rainbow, and you can see the fun results below! To download the "Make a Rainbow" tag: click on the picture below, right-click, save it to your computer, and print it like a regular 4x6 photo. 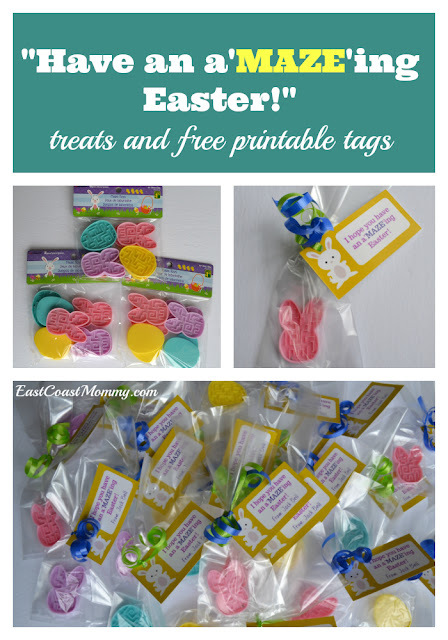 Once you have the tags printed, just hole-punch the corner, and use ribbons to attach them to bags of Skittles. 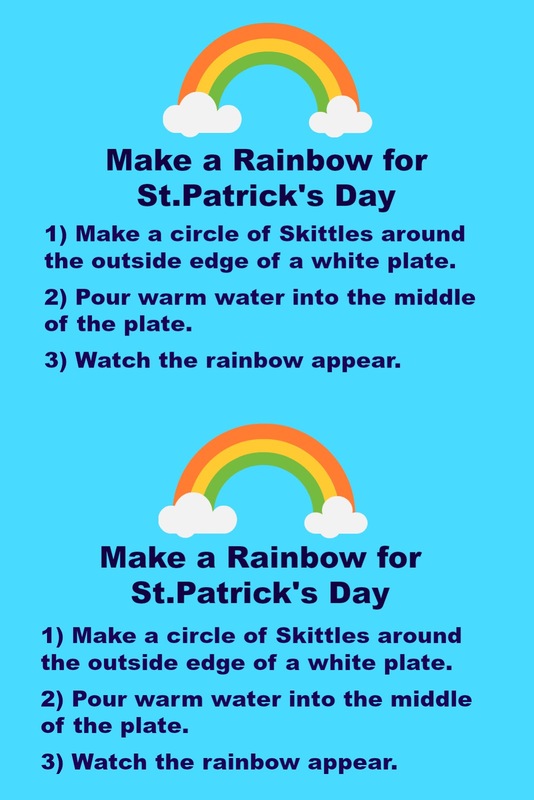 Isn't this a fun St.Patrick's Day activity? Do you have a child that enjoys science? 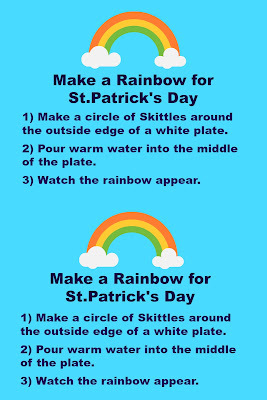 I think people of all ages would enjoy making a Skittles Rainbow on March 17! 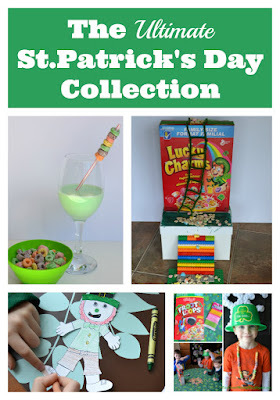 Find MORE St.Patrick's Day ideas here.